Proline were appointed to complete the installation of several catering counters at the AstraZenca Artisan Restaurant within their headquarters in Cambridge. 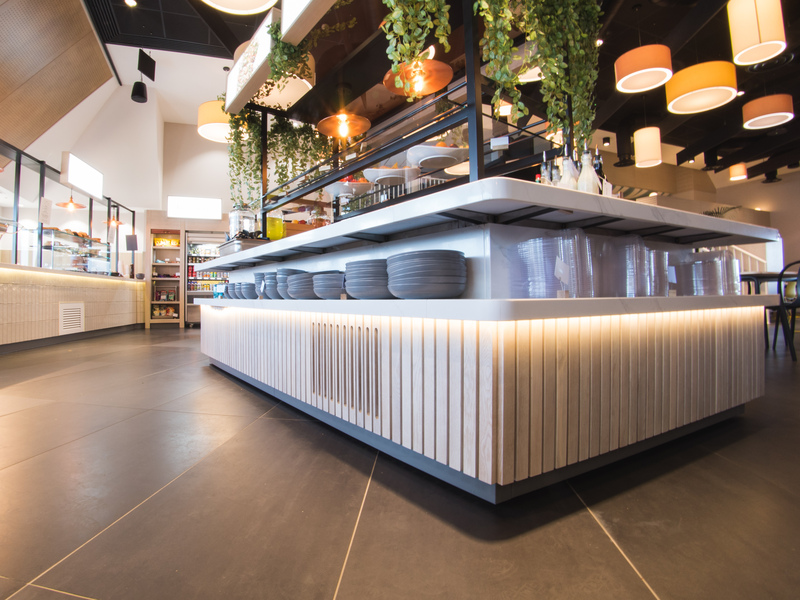 With this project, Proline installed a number of counters with various finishes such as Compac Calacatta Quartz worktops, ceramic tiles ref Arcadian and European Quarter Cut Oak Veneer with a 10% Lacquer applied frontages. As well as this, Proline also installed several high-level black powder coated stainless steel gantries above the various counters. AstraZenca is a research-based BioPharmaceutical company, discovering new science and delivering life-changing medications. Working with various institutions, AstraZenca assist these groups with the discoveries of new medicines and finding out about specific diseases. They currently work alongside four different groups; patient groups, UK HCP’s (healthcare professionals), the NHS and the government and policy makers. Within their main headquarters in Cambridge, the company has a staff restaurant situated within the building, the AstraZenca Artisan Restaurant serving a range of food offerings for staff. As the project was taking place, it was Proline’s duty to produce manufacturing drawings to help with the building and installation of the counters, source all the various finishing material and ensure the interface of the detail was correct, all before full installation of the product. Once the counters were installed and the project was fully completed, the client was more than happy with the result and felt that Proline had been able to achieve the goals of the initial brief. Paul Curran, Estimating Manager at Proline, said: “The main aim for a project like this is to get positive feedback and we know the end client and our customer i-line counters were suitably impressed, so much so that they requested a case study for the project.